All matter is made from atoms. Every substance (oxygen, lead, silver, neon ...) has a unique number of protons, neutrons, and electrons. Oxygen, for example, has 8 protons, 8 neutrons, and 8 electrons. Hydrogen has 1 proton and 1 electron. Individual atoms can combine with other atoms to form molecules. Water molecules contain two atoms of hydrogen H and one atom of oxygen O and is chemically called H2O. Oxygen and nitrogen are the major components of air and occur in nature as diatomic (two atom) molecules. Regardless of the type of molecule, matter normally exists as either a solid, a liquid, or a gas. We call this property of matter the phase of the matter. 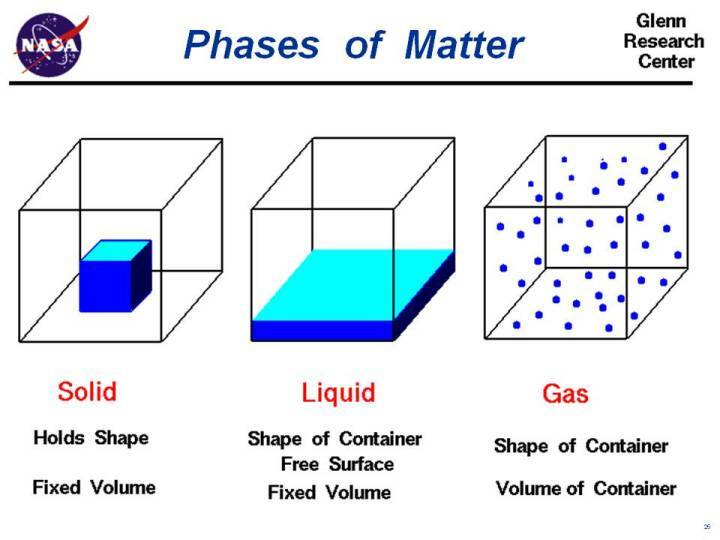 The three normal phases of matter have unique characteristics which are listed on the slide. In the solid phase the molecules are closely bound to one another by molecular forces. A solid holds its shape and the volume of a solid is fixed by the shape of the solid. In the liquid phase the molecular forces are weaker than in a solid. A liquid will take the shape of its container with a free surface in a gravitational field. In microgravity, a liquid forms a ball inside a free surface. Regardless of gravity, a liquid has a fixed volume. In the gas phase the molecular forces are very weak. A gas fills its container, taking both the shape and the volume of the container. Liquids and gases are called fluids because they can be made to flow, or move. In any fluid, the molecules themselves are in constant, random motion, colliding with each other and with the walls of any container. The motion of fluids and the reaction to external forces are described by the Navier-Stokes Equations, which express a conservation of mass, momentum, and energy. The motion of solids and the reaction to external forces are described by Newton's Laws of Motion. Any substance can occur in any phase. Under standard atmospheric conditions, water exists as a liquid. But if we lower the temperature below 0 degrees Celsius, or 32 degrees Fahrenheit, water changes its phase into a solid called ice. Similarly, if we heat a volume of water above 100 degrees Celsius, or 212 degrees Fahrenheit, water changes its phase into a gas called water vapor. Changes in the phase of matter are physical changes, not chemical changes. A molecule of water vapor has the same chemical composition, H2O, as a molecule of liquid water or a molecule of ice. When studying gases , we can investigate the motions and interactions of individual molecules, or we can investigate the large scale action of the gas as a whole. Scientists refer to the large scale motion of the gas as the macro scale and the individual molecular motions as the micro scale. Some phenomenon are easier to understand and explain based on the macro scale, while other phenomenon are more easily explained on the micro scale. Macro scale investigations are based on things that we can easily observe and measure. But micro scale investigations are based on rather simple theories because we cannot actually observe an individual gas molecule in motion. Macro scale and micro scale investigations are just two views of the same thing. Plasma - the "fourth phase"
The three normal phases of matter listed on the slide have been known for many years and studied in physics and chemistry classes. In recent times, we have begun to study matter at the very high temperatures and pressures which typically occur on the Sun, or during re-entry from space. Under these conditions, the atoms themselves begin to break down; electrons are stripped from their orbit around the nucleus leaving a positively charged ion behind. The resulting mixture of neutral atoms, free electrons, and charged ions is called a plasma. A plasma has some unique qualities that causes scientists to label it a "fourth phase" of matter. A plasma is a fluid, like a liquid or gas, but because of the charged particles present in a plasma, it responds to and generates electro-magnetic forces. There are fluid dynamic equations, called the Boltzman equations, which include the electro-magnetic forces with the normal fluid forces of the Navier-Stokes equations. NASA is currently doing research into the use of plasmas for an ion propulsion system.